Streamlines Microflex Wireless connectivity to conference room AV systems, with flexible analogue and digital inputs and outputs. 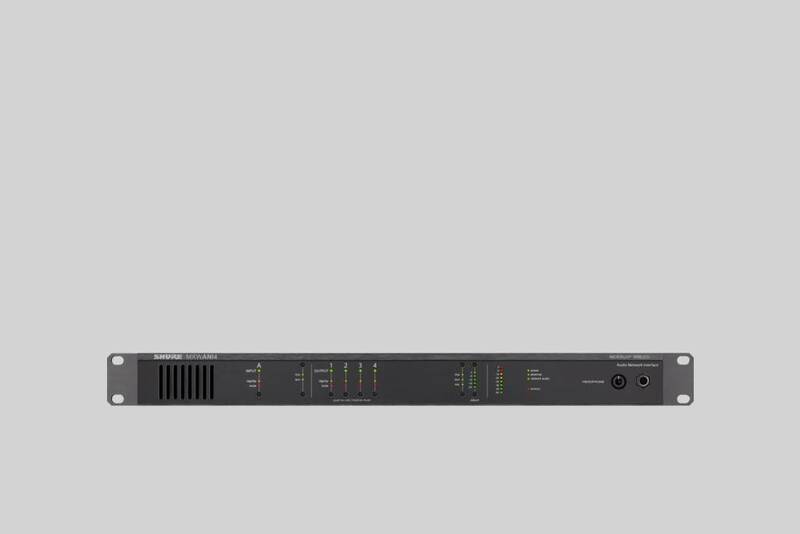 The MXWANI is a 4-channel Audio Network Interface compatible with Microflex Wireless microphone systems that enables easy out-of-the-box system setup with no additional networking hardware required. With per channel analogue outputs and a versatile 4-port gigabit switch, it is the central point for connecting and distributing Microflex Wireless systems to conference room AV networks. Front panel controls offer quick adjustments locally, or adjust system settings remotely from a networked PC or Mac through the Microflex Wireless Control Software. Audinate’s Dante® networking enables multiple channels of audio to be distributed to a variety of Shure wireless devices over an Ethernet network.